The number of Central Americans migrants who have left their children in the United States has risen to at least 142 and may reach several hundred, according to a July 23 agency statement to a district court judge in California. 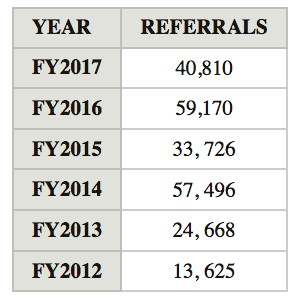 The rising total of self-separating families shows the foreign migrants are gaming the federal government’s asylum process to deliver their children to in-laws and relatives living in the United States. Once delivered by government officials, the migrants’ children can continue to apply for asylum, to attend Americans’ schools or and get jobs. 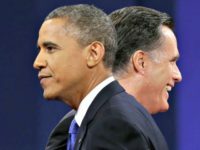 The same “Unaccompanied Alien Child” process has been used since at least 2010 to deliver more than 200,000 Central American children and youths to sponsoring relatives throughout the United States. In 2016, the Associated Press reported that at least 80 percent of the children were handed over to sponsors who are illegally in the United States. This agency cooperation with migrants is creating a semi-legal chain-migration pathway for foreign youths into the United States. “About half of the sponsors are a parent of the child, but the others are mostly close family members — aunts, uncles, that kind of relationship,” Kenneth Wolfe a spokesman for the Department of Health and Human Services, told Breitbart News. “It is not a deal-breaker” if the sponsor is in the United States illegally, he said. The numbers announced Monday are subsets of the 2,551 adults who were detained up to late June 27 by border agencies under President Donald Trump’s novel policy of enforcing border laws. The 2,551 migrants brought children aged five and older. However, the limited space at family-detention centers and the pro-migrant decisions by two judges — including U.S. District Judge Dana Sabraw — are forcing officials to release all migrant children after 20 days and to release most migrant groups as they come over the border. The legal memo says that 130 of the 2,551 parents “waived reunification” with their children, so leaving them in the United States. At least 12 deported adults in a prior group of 102 adults who carried children under four into the United States have also decided to leave their children behind. In 463 cases, “case notes indicated adult is not in U.S., under review,” the statement says. This 463-strong group may include migrants who went home without formally waiving unification with their children. In 64 cases, federal officials say they cannot release the child to the adult who brought the child into the United States. This group of 64 adults may include smugglers or criminals or parents with a criminal record. The document does not specify how many of their children will be allowed to stay in the United States. The document also mentions another group of 260 adults or children and noted that “many of these children have been discharged by ORR in appropriate circumstances. “ORR” is the Office of Refugee Resettlement at the Department of the Health and Human Services which is responsible for sheltering children for several weeks before delivering the migrant children to their sponsors in the United States. The data suggest that the groups — 130 parents, 12 parents, 463 adults, 64 adults, and 260 adults or children — may result in roughly 700 children being placed in homes through the United States. ACLU lawyers are asking Sabraw for more information about the migrants, partly so they can persuade the parents to separate from their children so ACLU can file asylum cases for the children. The ACLU-directed process can be used for the all 2,551-plus children once the parents have been set for deportation. In 2017 and 2018, Democrats in the House and Senate have refused to reform this legal process. Business-first GOP leaders have refused to pressure Democrats to reform the process. The media is also treating the dispute as if it only concerns 2,551 migrant adults and their children, but not the 330 million Americans who live in the United States. The Trump administration said in a court filing Monday that 463 parents of migrant children are no longer present in the United States, indicating that the number of mothers and fathers potentially deported without their children during the “zero tolerance” border crackdown could be far larger than previously acknowledged. The progress report to U.S. District Judge Dana M. Sabraw cautioned the 463 cases are “under review,” meaning the filing was not a definitive tally of all migrant parents who have been deported while their children remain in U.S. government shelters. So far, 130 of those parents have opted against a reunion, in some cases preferring their children be allowed to remain in the United States with another relative while their immigration appeals are pending. The Trump administration reported to a California federal judge on Friday afternoon that as of 7 a.m. that morning, 450 of the 2,551 migrant children older than age 5 who were taken from their parents have been reunited. U.S. District Judge Dana Sabraw, who previously took the government to task for missing reunification deadlines and making disingenuous arguments about the children’s welfare, gushed over the “great progress” made so far. This was “the fourth case with the same factual situation this court has had in as many weeks,” Hanen wrote. 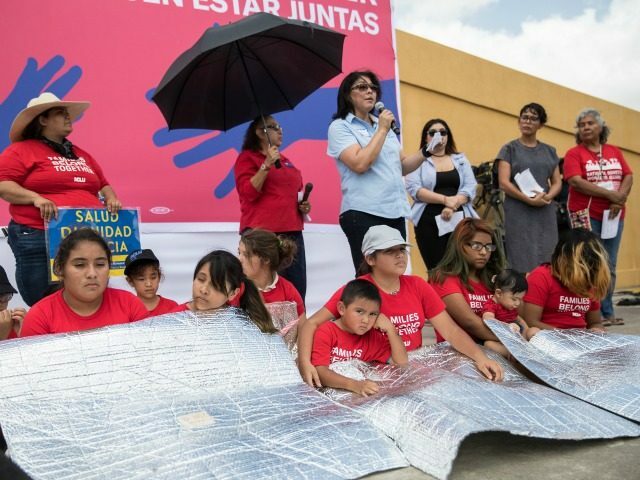 In response to a Freedom of Information Act request, the Department of Health and Human Services provided data showing that 80 percent of the 71,000 mostly Central American children placed between February 2014 and September 2015 were sent to sponsors who were not here legally. Another 6 percent were placed with adults who had temporary protected status, a U.S. government program that has let some Central American citizens stay and work in the country legally for more than a decade. Four percent were sponsored by American citizens and 1 percent by immigrants facing deportation proceedings. Many of the others were placed with sponsors who had other forms of legal status or who have filed immigration applications. Many of the 230,000 children and youths are being delivered by the federal government to their illegal-immigrant parents who are working illegally in underground economy jobs – despite the impact on Americans’ communities and schools. Some of the youths have been part of the murderous MS-13 gang. Since 2012, the Department of Homeland Security has referred at least 230,000 UACs to the HHS. Roughly 90 percent of them were released to sponsors throughout the United States, according to the HHS. The loophole-plagued U.S. border law is understood by migrants, including José Ottoniel, who lives in a hilltop village in Guatemala, according to the Washington Post. Ottoniel borrowed $4,000 from a smuggler but earns only $21 per week in Guatemala. The family will likely lose their home to the bank to pay off the debt. he thought his [migration] plan was a beautiful one. He would escape his hard life in the tiny town of Libertad — Freedom, in Spanish. His children would not grow up in the same poverty that he had endured — he had dropped out of the fourth grade to sell burritos to help his single mom support him and his four siblings. He figured once he was processed he would be released with his son to fight his case in the courts. At worst, the two would be deported together back to Honduras. Four million Americans turn 18 each year and begin looking for good jobs in the free market — but the government provides green cards to roughly 1 million legal immigrants, temporary work-permits to roughly 3 million foreign workers, including at least 400,000 migrants seeking asylum.